How do we trade with Fibonacci levels? Before we discuss this lesson, we need a prior understanding of support and resistance. 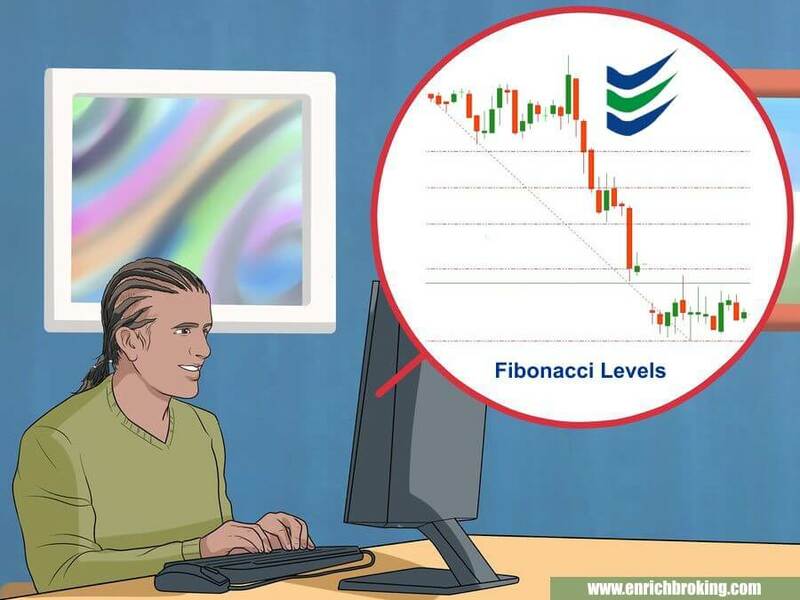 The ‘Fibonacci” refers to a tool that measures the size of a price move and then places support and resistance levels horizontally on a price chart. The support and resistance levels are known as "Fibonacci levels"
These levels are used to make trading decisions in the usual way as normal horizontal support and resistance levels. How to set up Fibonacci retracement levels in Meta Trader 4 (or) Ami Broker Chart? The beginning and the end of the price move in any direction can be identified. The distance of that move can be measured by the Fibonacci tool. The Fibonacci tool will automatically place what is known as “Fibonacci retracement” and extension levels. The calculations of the Fibonacci levels are based on the numbers in the Fibonacci sequence, or the percentage difference between them. Let’s discuss how to use this tool rather than considering the mathematics behind it. The Fibonacci tool is applied manually. Apply the tool at the beginning of the move to the end. It is applied from left to right. The chart below depicts the 38.2%, 50% and 61.8% levels. These are usually used even when there are other retracement levels that have been found and work productively. How do we select the extension level at which to take profit? To increase profitability, the extension levels can be matched to the corresponding retracement levels. For instance, if the price retraced to the 38.2% retracement level, then the related extension level would be the 138.2. The chart below is an illustration of extension levels in a downtrend. Enter a position at one of the retracement levels when the price pulls back and then exit at one of the extension levels. The related extension to the 50.0 or 61.8 retracement level is the 161.8. The tool is applied from the bottom and ending at the top. It is always applied from left to right. The following chart depicts the same. Fibonacci levels are automatically placed in MT4 or Ami Broker Chart. The chart above illustrates, once the Fibonacci tool has been applied, it automatically places the Fibonacci levels between the start and the end of the move. These levels are known as retracement levels. The level that has been placed half way between the start and the end of the move is the 50% retracement level. When the price retraces halfway back, it is said to have retraced to the 50% level. Based on the trend direction, it acts as support or resistance. The most widely used levels that the price could retrace are 38.2%, 50% and 61.8%. The retracement levels indicate how far the pull back could be. The chart below is an illustration which depicts the Fibonacci tool being applied to an uptrend and the 38.2%, 50% and 61.8% levels were placed in between the start and the end of the move. We can use these levels for potential entries as the price could retrace back. How do we choose the correct level to enter? Two methods can be adopted to select which retracement levels we can use to enter into the market. A. Aggressively enter as the price reaches each level. Entry at each retracement level could be made by placing a stop loss on the other side of the Fibonacci level. When the stop loss is hit, we need to enter again at the next level and move on until the price comes back in our support. B. Wait until the price finds support or resistance at these levels first, and then enter. Wait until the price finds support or resistance at these levels, wait for the price to return to the original direction of the trend and then enter. We need to note that Fibonacci is a part of a trading system and not trading system. As we know that, the Fibonacci tool is used to establish the retracement levels, it can also project extension levels. This can depict where the price could go to. Fibonacci extensions can be utilized for profit taking and counter trend entries. 138.2% and 161.8% levels are widely used extension levels even though different traders use different extension levels. Application of Fibonacci tool to an uptrend. We can observe the retracement and extensions levels. Why do Fibonacci retracement and extension levels correspond with each other? Targeting a Fibonacci extension level is one of the techniques adopted by banks & financial institutions to take profit. They will be anticipating other banks and traders to do the same. There is no rigid rule and there must be a confirmed trend even though extension levels work as self-fulfilling prophecies. Exit when the price seems to find important support or resistance there. It is considered a good exit if the price seems to have trouble breaking through a Fibonacci level. for both long trades in an uptrend and short trades in a downtrend. The levels placed between the start and the end of the initial move is retracement levels and they show where the price could retrace back to. The most common Fibonacci retracement levels are the 38.2 %, 50% and 61.8% and are commonly used for entries into the market. Wait until the price finds support or resistance at these levels first, and then enter. The most common extension levels are the 138.2% and 161.8% levels and are commonly used for exits out of the market. Retracement levels and extension levels can correspond, with a retracement to the 38.2% usually on to the 138.2% and a retracement to the 50% and 61.8% usually on to the 161.8% level.